The Roswell Police Department is seeking the public’s assistance in locating a fourth suspect involved in a shooting late last month. 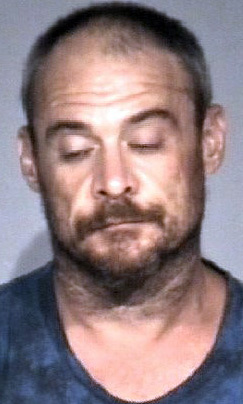 An arrest warrant was obtained Wednesday for Thomas Joseph Dellavecchio Jr., 42, of Roswell. He is described as 5’10”, 220 pounds, with black hair, blue eyes, a scar on his right arm, and tattoos on his left hand, left arm and left shoulder. Three other individuals were arrested within hours of a shooting that occurred around 2 p.m. Aug. 29 inside a residence in the 1600 block of South Washington Avenue in Roswell. A 35-year-old Roswell man was shot in the face and neck, and is expected to recover from the injuries. David Clements Jr., 30, was arrested and charged with accessory to aggravated battery with a deadly weapon, conspiracy to commit aggravated battery with a deadly weapon, false imprisonment, and intimidation of a witness. Jessica K. Tarleton, 33, was charged with accessory to aggravated battery with a deadly weapon, conspiracy to commit aggravated battery with a deadly weapon, false imprisonment, and distribution of marijuana, and Veronica L. Perez, 32, was charged with tampering with evidence and false imprisonment. Police believe Dellavecchio was the individual who shot the victim, and he is wanted on charges of aggravated battery with a deadly weapon, false imprisonment, and being a felon in possession of a firearm. Anyone with potential information regarding his whereabouts is asked to call the RPD at 624-6770 or, anonymously, Chaves County Crime Stoppers at 1-888-594-TIPS (8477).